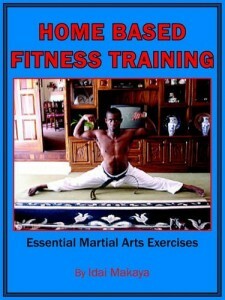 Idai’s Home-Based Fitness Training manual looks at designing workouts for both martial arts and general fitness conditioning. The focus is on conditioning for strength, technique, aerobic fitness and flexibility. The recommendations made are based on the most up-to-date research available in fitness and martial arts training. Emphasis is placed on training efficiency so that you can reach your fitness and conditioning goals using the minimum time and effort required. This ‘minimalistic’ approach is made possible by giving readers a clear understanding of how and why the body responds to training stimuli in the way that it does – which then allows trainees to design their training routines around very specific “essential exercises” – selected to meet their individual goals. By training correctly and scientifically, almost any performance goal in martial arts conditioning or general fitness can be attained. Anyone seeking general fitness and flexibility – or a functional (and athletic) ‘fighter’s body’ – will find this manual indispensible. It’s time to discover your true potential! Read the introduction Chapter here.